Diffuser Wrap Bracelets are unisex and one-size-fits-all. 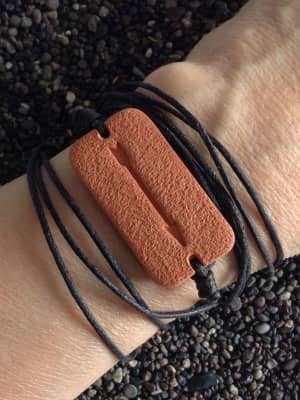 Diffuse essential oils wherever you go with this trendy new piece of Terra Cotta Pendant diffuser jewelry! The Arrow clay piece measures 1 1/2 inches by 3/4 inch / 3 8/7 cm by 2 cm. The cord is 64 inches / 158 cm long. See more info about them, more photos and a video on how to wear it here! This is my new favourite piece of jewelry! I wear it everyday!! I especially enjoy wearing it while at yoga class so I can diffuse scents that allow me to fully relax and focus on my practice.